How to inspire glamour on an international scale? 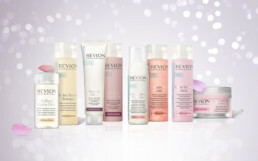 Revealing Revlon Professional is the aim of the global brand repositioning project: a new brand portfolio, new international positioning and brand storytelling, the international re-launch of all sub-brands within the colouration and hair care categories. Revlon Professional’s new positioning, with Isabelli Fontana as spokesperson, is dedicated to inspiring glamour and connecting with people on an emotional level, and will be circulated through all channels and across all markets.